This post was submitted by Carol. I got laid off in 2008 from my last ‘real job’ because I worked for a real estate company and they closed shop. It’s been a string of temp jobs since – and nothing’s been promising. I always know when a meeting is gonna be my last by the prickly feeling I get between my shoulders – and the feeling is always right. Last temp job: I put sticky notes on the piles of papers I had to work on in the following week- instructions on where I was in each process – for no reason at all at the time. I left on a Friday and got an email that evening that I wasn’t needed anymore. The online job ads are phony and no one wants to bother to pick up a phone. I would even take contract work if it was straight from a company and not a temp recruiter. I’m not picky anymore – but my dream is permanency. It always has been. This post was submitted by JT Espinosa. This is not my story. It is my Grandfather’s. It has come to me via my father, in one of those “You think this is bad? I’ll tell you bad..” stories. During the early 1930’s my grandfather was working as a truck driver for Coca Cola in central Kentucky. He was married with two infant children, my dad and my uncle. 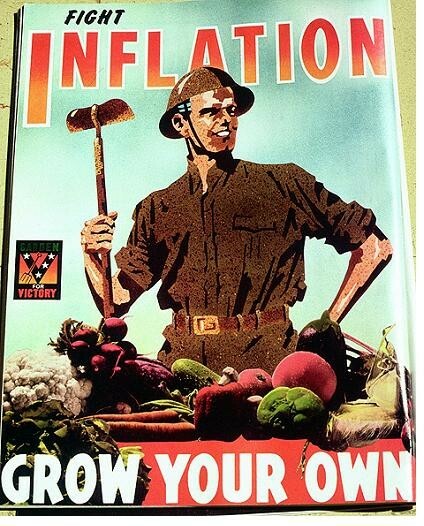 The depression was not only causing a tremendous loss of jobs, it was causing something we have not seen: deflation. Manufacturers were cutting the cost of their products in a vain attempt to stimulate demand. The only way they could do this was cut wages. My grandfather had his meager wagers cut in half, to a level that could not sustain his young family. There was no second job to look for – he was lucky to have anything, and grateful to Coke that he was not let go. The one consolation was that everyone else around him was in the same boat. In a time before unemployment assistance and >25% unemployment, how did they survive? The money was just enough to pay the rent and for food for the children. My grandmother and grandfather survived for several years on a garden my grandmother grew in a small backyard plot. She had a green thumb that not only fed them but provided enough extra that they traded vegetables for other staples they needed. My father recalls a time playing in the garden that kept them alive. Times eventually got better and my grandfather rose in the company and eventually retired as a VP. Still, until my grandmother moved into an assisted living center in her early 90’s, she always had a garden, always canned fruits and vegetables and always saved for a rainy day. So when I think about how bad it is now, I guess my Dad is right, it could be worse. We can survive this Great Recession. This post was submitted by Roger. All my life I have always heard that longevity in a job shows you are stable and looks real good on your resume’. Well, I am a stable person by nature anyway, so staying at the same job is no problem for me. The problem is the career path I chose. Actually, I didn’t choose it, I fell into it quite by accident. Way back in 1982, I saw a want ad published by a recruiter for a dental assistant for $15,000. I inquired about it and when I had the interview with the recruiter, all she talked about was a job with Loyola Federal as a mortgage processor for $6700.00. I asked what about the dental assistant job? She said, “oh, that’s not available”. So there goes my start in the mortgage business. I was only 17 at the time and still living at home, so I was not pressed to make a certain salary. Anyway, fast forwarding to 2011, I made an observation. I never lost a job the first 14 yrs in the mortgage industry. In the last 16 yrs., I have been laid off 4 times. I have now been laid off for 7 months. I am a mortgage underwriter and my 30 yrs of experience apparently is meaningless in this crappy economy. In my most recent job, 4 out of 8 people in our MD office were laid off a week before Christmas and only 9 days after the company Christmas party. Real nice, huh? The rest of us were gone when office was shut down all together, which was no surprise. Problem that I see is that in the first 14 yrs. I never lost a job because I would leave a job before it got bad enough for offices to start closing. I would say safe zone was 2 – 3 years. So I have concluded that longevity in a job doesn’t pay. Keep on moving.. This post was submitted by Irene . Creative Microsystems, they build on-board truck scales. Loadman is the name of the product. BOY! Is it ever a LOAD man, a load of s**t! My job was to build the arm and fork boxes that record the weight of the dumpster that the truck picks up, also I have to build the cables to go with this system, the person next to me builds the meters that the arm and fork, record the weight information too. When I started there, my trainer, a few months later he quit to go be an electrician, well with the 4 months training I got I took it and tried my best to fill his shoes. Mind you I was hired as an assembler, not a technician to make this stuff work. Anyway, I thought that Chris was my supervisor, I could not find him in the company for five mins. to ask him a question on when I got stuck, so I went to the next person up, Larry, his attitude was “why are you bothering me with this?”, I guessed that your supposed to figure this stuff out yourself… ok, with no training manual or accurate diagram of the boards on question, I plowed on the best I could, with no guidance, but a drawn up book I made myself from some old notes of which that book vanished. 2 people came and went of who I trained of what I was given the material to work with…. are you dear reader confused yet? so then we got a 3rd person in, Peg, I trained her up to what material I had, in fact I made a copy of my book to give to her (mistake on my part never should have copied that book! I did that at Newton, once that got their “training manual” they terminated me) She went ahead and built the arm boxes and the fork boxes, she said she would build the arms if I would build the forks that they were too hard. Sounds ok, she was having as many if not more problems with the forks, that I was having problems with, also I was building the cables, and putting together manuals on how this stuff works. Also I had to test the boxes, before we potted them. With the potting material, some times you get a bad bach, well most of them were bad of which I made the stuff work, but wrote a note that the material was bad. Pegs and my work was shipped, my forks were fine, pegs arms were having problems, and came back, who got the blame? ME! Not Peg oh no, she would get upset don’t do that, blame someone who did not build that arm. Now before you accuse me, I watched her like a hawk to see what she was doing right and wrong before we potted the arm box. They worked like a charm! And so did my work! The installers must have messed some thing up bad out there, the stuff failed in the field, who got the blame? ME! So I am laid off, and the production person they have left, cannot lift 50 lbs+ to build the cables, she is fragile, and she claims that she was hired as a assembler not a technician. I am in the same boat. they wanted an assembler. well the unemployment just shot up to 10.2% Thanks to Chris at CMS, HAPPY? This post was submitted by MFX.